How many times have you read about the importance of wearing sunscreen? Born and raised in sunny south Florida and being fair skinned with light hair and light eyes I have never once been able to go to a dermatologist or esthetician without being told that I should be wearing sunscreen every single day. However, if you read my recent post about homemade beauty products then you know why I am becoming increasingly concerned about the abundance of toxic ingredients lurking in so many skin and beauty products. And sunscreen is most definitely not an exception. Although sunscreens are intended to protect your skin from sun damage I am highly suspicious of potentially harmful ingredients found in the average sunscreen, especially since I have an autoimmune disease (MS). Active ingredients in sunscreens come in two forms, mineral and chemical filters. Each one works differently, but both mineral and chemical sunscreens may pose hazards, especially if you are slathering them all over your entire body every single day! For example, oxybenzone is an FDA-approved sunblock ingredient that acts like estrogen in the body and has even been associated with endometriosis (I know a thing or two about this condition because my mother had it and it prevented her from getting pregnant with me for eight years!) Homosalate is another active sunblock ingredient that not only disrupts estrogen but also wrecks havoc on the hormones androgen and progesterone. While mineral sunblocks (such as zinc oxide and titanium dioxide) are safe alternatives to chemical sunblocks, they don’t absorb well into the skin and typically leave an annoying white film. The point is, wouldn’t it be great if you could protect your skin without slathering on a sunscreen every single day? So then, do natural sunscreen alternatives exist? The answer is yes. And they are so safe you can even eat them! Edible sunscreen might sound somewhat off-putting, but they are basically just nutrients found in certain foods. 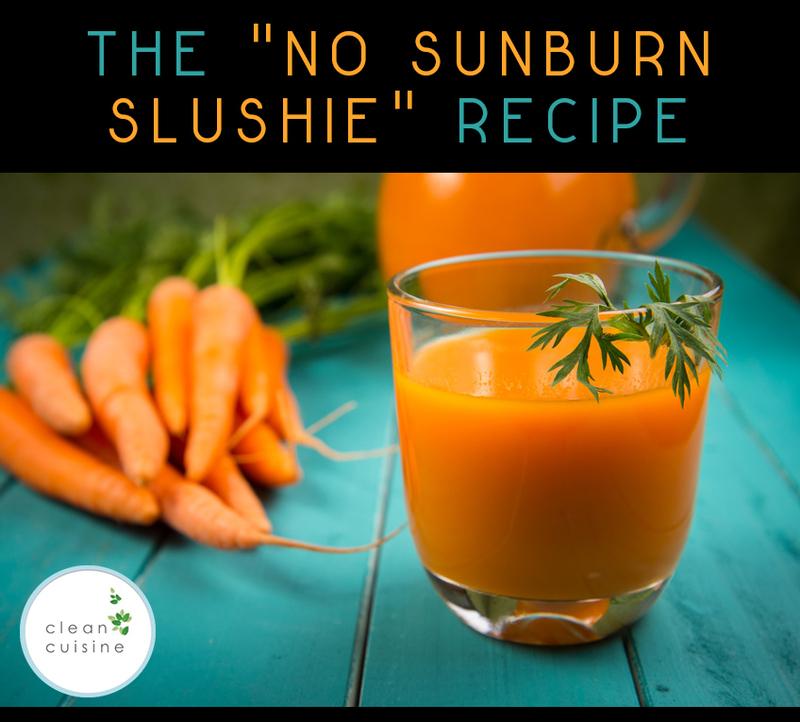 I first became aware of the potential role food played in protecting skin from sun damage back in 2005 when my husband, Andy, and I moved back to Florida after living in New Jersey for 5 years during his surgical residency. Andy and I were both raised and born in south Florida, we are both fair skinned and we both burned rather easily as kids. When we moved back to Florida we had lost our “base-line” tans, but we were eager to hit the beach! The first day back on the beach I slathered on a thick coat of mineral-based sunscreen that turned my skin a terrible pasty white and Andy didn’t wear a thing. It was no surprise that I didn’t burn, but what was surprising was that for the first time ever, neither did Andy. What was protecting Andy’s skin from the sun that day? His genetics certainly had not changed and neither had the harsh Florida sun. The only thing that was radically different in his life was his diet. After we were married he adopted the same anti-inflammatory diet that I was following to control my symptoms of MS and it turns out some of the staple anti-inflammatory foods we were eating every single day have actually been clinically proven to protect the skin from sun damage. What is more some of this protection can be obtained in supplement form, too! Anti-inflammatory nutrients proven to reduce sun damage and provide protection from sunburn include flavonoids, carotenoids, tocopherols and tocotrienols, and omega-3 fatty acids. All of these substances have been proven to be orally bioavailable for this purpose, meaning you can take them by mouth and levels will rise in your skin where they do their work. And all of these nutrients were foods we were eating regularly as part of our anti-inflammatory diet. Omega-3’s from Seafood: Of all the skin-saving, nutrient-based sunscreen alternatives that have been studied, omega-3 fatty acids in the form of EPA and DHA seem to have the most research behind them. Human studies show omega-3’s offer an impressive 35 percent increase in the amount of time it takes sunlight to redden the skin. Keep in mind however, EPA and DHA are the omega-3’s found primarily in seafood. The omega-3 fats found in chia seeds, flaxseeds and walnuts are not nearly as beneficial when it comes to skin protection. Since the best sun-protecting results occur at doses as high as 4 grams of EPA and DHA omega-3’s daily, supplementation is really your best bet for maximum benefits. Note: Omega Guard is a super purified omega-3 supplement containing EPA and DHA. 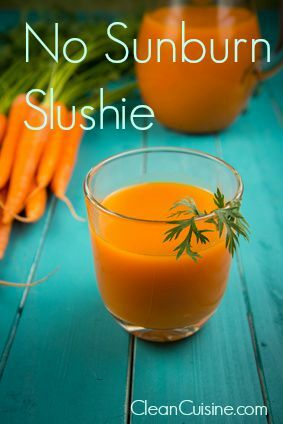 Foods Rich In Beta-Carotene: Not only does it taste ultra refreshing on a hot, sunny day, but the “No Sunburn Slushie” recipe below is made with carrots and mango, both of which are super rich in skin-saving beta-carotene. Other foods rich in beta-carotene include sweet potatoes, leafy greens, cantaloupe, grapefruit, cherries and papaya. Place all ingredients in a blender and process until smooth and creamy. Drink cold. 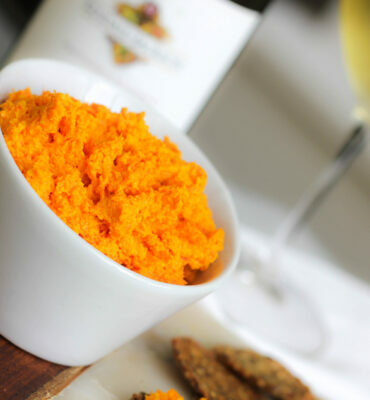 Lightly steaming the carrots and adding a smidgen of healthy fat in the form of coconut oil helps to enhance your body’s ability to absorb the beta-carotene. Foods Rich In Vitamin E: Foods rich in the full-spectrum of vitamin E in the form of mixed tocopherols and tocotrienols such as almonds, kale, raw seeds, spinach and turnips have also been shown to offer significant protection from sun-induced skin damage. Vitamin E supplements can also provide protection. It is important to point out that most vitamin E supplements contain only alpha-tocopherol (and the cheapest supplements contain only a synthetic substance called d-alpha tochopherol) and research shows that to get the most sun-protecting benefit you need the full spectrum of vitamin E found in real food in the from mixed tocopherols and tocotrienols. Note: Some high quality supplements do contain vitamin E from mixed tocopherols and tocotrienols, but you need to read the labels to make sure! Chocolate! Believe it or not, antioxidant-rich cacao found in high-quality dark chocolate more than doubles the length of time you can stay in the sun without burning. Foods Rich in Lycopene: One study showed lycopene-rich tomato extract provided about a 40 percent increase in the length of time to develop a sunburn. Synthetic lycopene supplements did help also but only by about 25 percent. The assumption is that the mixture of carotenoids in natural tomatoes is more effective as an antioxidant than isolated lycopene alone. Watermelon is another food super-rich in lycopene. 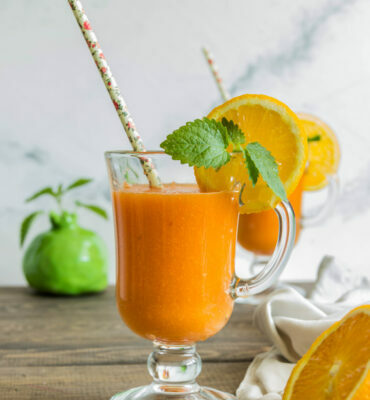 Next time you plan to spend a few hours outside, consider sipping on fresh Watermelon Juice or this “Better than V-8” smoothie recipe. Green Tea: A 2013 study in the British Journal of Nutrition, revealed the catechins in green tea not only make your skin more resistant to ultraviolet radiation from then sun’s harmful UV rays, but also protect against premature skin aging. While you may not want to drink a hot green tea at the beach, iced green tea is definitely a refreshing option. And if you add a squirt of lemon juice, you’ll boost the activity of the skin-protecting catechins in your green tea even more! In conclusion, there is strong evidence fruit, vegetables, and omega-3 fatty acids do provide protection against skin damage from the sun while also providing a myriad of other health benefits. However, if you plan on being in the sun for an extended period of time I don’t necessarily think you should rely on food-only as a sunscreen alternative, but using a “clean” sunscreen and eating foods that have been shown to protect against sun damage is not an either / or decision! You can….and should…do both. Too Hot to Workout Outside? Try our zero impact 30-minute workout solution! When you are cooking with Coconut Oil, which kind are you using, refined or unrefined? Hi Lynda, I always use unrefined, organic extra virgin coconut oil (Barlean’s has been my favorite for years now) Hope this helps? 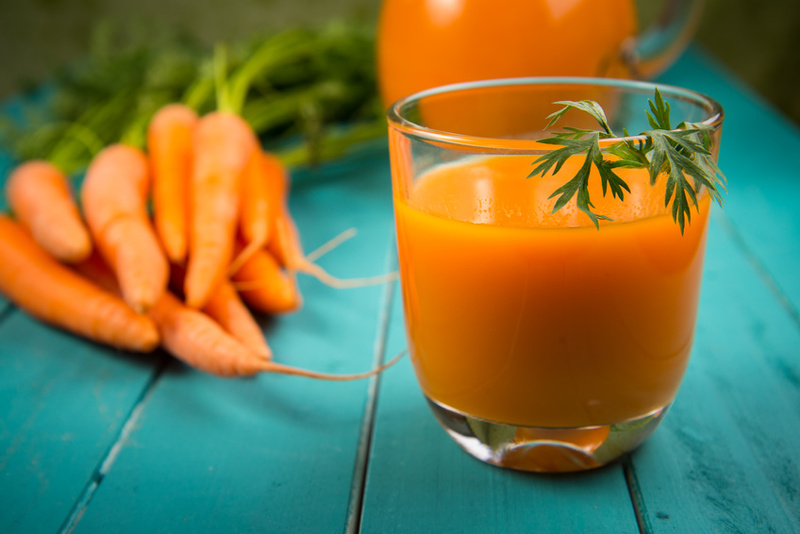 Instead of “shredding and lightly steaming” the carrots … could you simply chunk them in the Vitamix with the cup of water and blitz them for a minute or so? That would certainly heat them to the point of lightly cooked, and save a step. Love the insight you shared in this post. As a South Floridian, I’ve been searching for ways to internally protect myself from the sun (along with the physical zinc oxide I use while in the sun). I’ve started taking natural pycnogenol (French maritime pine bark) supplements daily to protect from UV rays. Have you heard anything about this, or ever tried incorporating this yourself? I also mix up turmeric face masks after sun exposure and add powdered turmeric to my morning smoothies often. Hi Heather! I’m so glad you found the article helpful =) As for the pycnogenol, yes I have heard of it! I’m not totally sure if it is the same or similar to fernblock (Polypodium leucotomos fern) that is found in Heliocare ( http://www.heliocare.com/ ) but I have used Heliocare in the past. I DO think it helps. It’s just a bit pricey. You can read more about it and a few others here: https://www.futurederm.com/the-truth-about-sunscreen-pills/ -I think a number of plant phytochemicals have the ability to protect against sun damage, I just think not very many have been studied extensively, you know? And I CRAZY for turmeric! I do the same thing with the masks and smoothies.